The ATOVS Reader program reads files in the NOAA Level 1B, and compressed or uncompressed Eumetsat Level 1C and Level 1D formats. Data from each of the twenty infra-red HIRS/3 channels, or any of the 20 microwave AMSU-A or AMSU-B channels may be displayed as a false-colour brightness temperature plot. Data is geographically rectified and displayed on various wide-scale projections. The program can be automated for hands-off operation of an ATOVS receiving system such as that offered on the EUMETSAT EARS service. Please note that if you want to process the MSG-1 compressed data from the EUMETCast service you need my MSG Data Manager and GeoSatSignal programs. If you want to receive the AVHRR data, high resolution image data, you need my AVHRR Manager and HRPT Reader programs. I have provided more details of receiving data from broadcast satellites using DVB equipment. You should also take a look at Hugh Marnoch 's site at: http://www.marnoch.org/msg/skystar.html. V1.0.2 Add saving of display as JPEG image files, allow resizing of display, provide more map projections, provide choice of regions, display cursor brightness temperature and location, register explorer right-click for L1B files, display registered user name, tweak for Large Font display. V1.0.4 Add Atlantic region (matches Digital Atmosphere), draw 10 degree gridlines with Atlantic region, add choice of background colour. V1.0.6 Add Kelvin/Celsius display option, add fixed maximum temperature option, correct thick pen being used after data read error. V1.0.8 Add filename display to title bar. V1.1.0 Add save of binary latitude/longitude/temperature data, improved Linux/Wine compatibility, add experimental South America region, make gridline display optional, add display pass group function, track channel changes in displayed temperature-at-cursor, support NOAA-18 MHS L1C data over EUMETCast. V1.1.2 Trap satellite name being not byte reversed, warn if L1B variant is not supported. V1.1.4 Support Metop-A data over EUMETCast, Centre View|Diagnostics and Help|Register displays on the main form, compiled with Delphi 2007. V1.2.0 Compiled with Delphi 2009. V1.2.2 Add north-polar region for fast-dump data from the Metop FDES service. You can register the ATOVS Reader here. The program requires registration, and a trial period registration is available on request. The NOAA polar orbiting satellites carry a variety of instruments that in an orbit that provides global coverage. 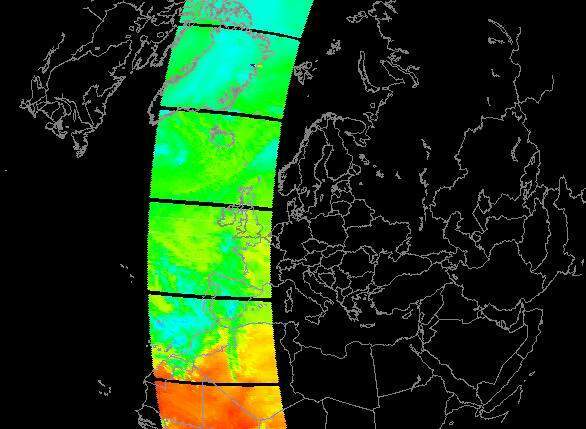 In addition to the high-resolution AVHRR scanner, which can provide stunning false-colour images, the satellites also carry sounders, which operate in the infra-red and microwave bands. The infra-red sounder is called HIRS/3, and the two microwave sounders AMSU-A and AMSU-B respectively. These instruments provide much more spectral detail about a pixel, what its apparent temperature is in 40 different wavelengths, but at fewer pixels per scan than the AVHRR scanner. 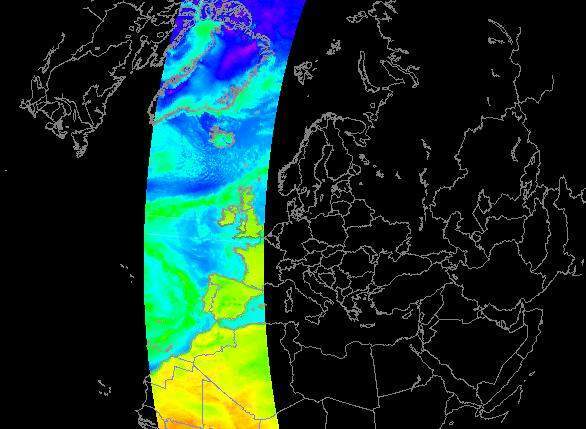 ATOVS thus allows analysis of the atmospheric state in the vertical profile as well as parallel to the ground. The data formats supported by the ATOVS Reader include the data broadcast over the EUMETCast service, and L1B data from NOAA-15 or later downloaded from the CLASS archive. These images were produced by combining images from two parts of the same pass in Paint Shop Pro. Because data is available from more than one ground station, greater ground coverage is possible.